Basil is a highly fragrant herb and is believed to have originated in India where it has been cultivated for over five thousand years. It is now grown throughout the world and and is a prominent feature in many national cuisines, particularly Italian, Thai and Vietnamese. There are over sixty different varieties of basil but the one used in Italy is called Sweet Basil and its primary use, in conunction with pine nuts, parmesan cheese and olive oil is in the production of pesto. Basil grows to a height of between 30cm and 130cm, depending on the variety. The stems and leaves are completely covered with fine hairs. The leaves are a bright green with a silky feel and are between 3cm and 11cm long and 1cm and 6cm in width. Basil is an annual and flowers briefly during the season with small, white flower on a terminal spike. 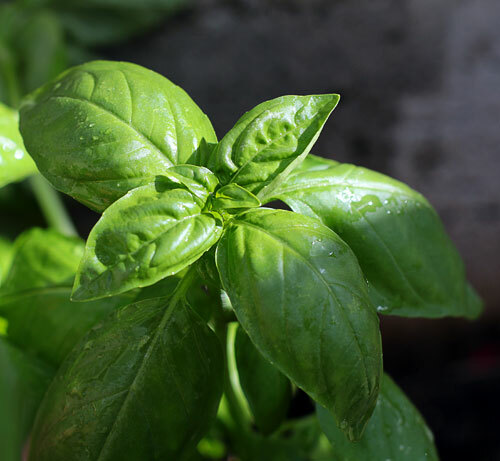 Basil is very sensitive to cold, with best growth in hot, dry conditions and well drained soil. If there is any chance of frost it will not survive but can easily be grown indoors in a pot on the windowledge or outside under glass. In Italy it grows well over most of the country although higher, northern areas may find it more difficult. Along the coastline and all over southern Italy it is prolific and grows with very little attention. It is not a well known companion plant and it is often believed that its strong taste can pass to any vegetables it may be planted alongside. Tests have been done by planting tomatoes and basil together and this theory was proved false. Basil was originally grown for eating, particularly for flavouring plain foods like fresh tomato sauce, and was not believed to hold any medicinal benefits. Recent research has found that it holds a significant amount of Vitamin K which is essential for blood clotting and also Vitamin A which is important for the health of blood vessels and for preventing a build up of cholesterol. The herb also contains iron, calcium, manganese, magnesium, vitamin C and potassium. Other than for the world famous pesto, basil is used freely in Italy and is a welcome addition to many pasta sauces. It is best used completely fresh and added just at the end of the cooking period in order to maximise the intense flavour. The name 'basil' is dervived from the ancient greek word 'basilikon' which means 'royal'. It is considered by many chefs to be the King of all herbs. In Italy, basil was once known as a symbol of love. In ancient times it was believed that placing basil leaves on insect bites would draw out the poison. It is thought that Alexander the Great bought basil to the Greece in 350BC and it then spread to the rest of the Mediterranean region.